Reminiscent of those settee protectors your Gran used to use, this is a great way to use a small piece of fabric you’ve fallen in love with – or an old piece you can’t bear to part with. I haven’t added a zip but if your cushion is going to subject to frequent use, you may like to add one to enable you to hand wash it. 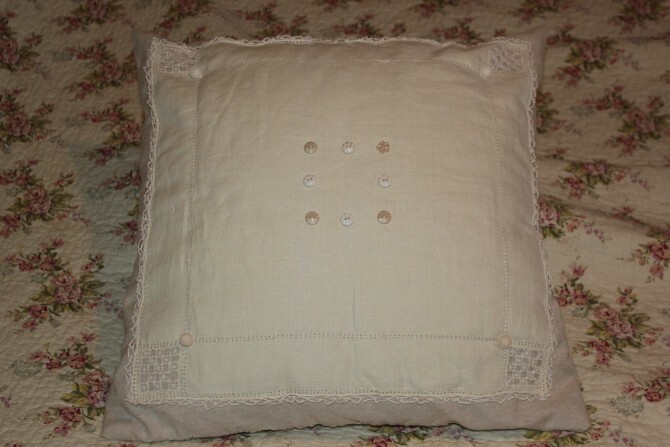 An easy way to add a shabby chic feel is to add oodles of extra lace and/or buttons – sometimes, it really is ‘the more the merrier’! And remember, with one-off cushions especially, I think it’s worth stressing the importance of finding the cushion first and making the cover to fit. We’ve all done it, but it can be so frustrating to make the cover first then waste time looking for the correct size inner…!